When I had my first child we had a lot of flannel receiving blankets and we used them for everything from swaddling to burp cloths to makeshift diapers when we were washing. The blankets are still sold and given as gifts for almost every baby I know. The new receiving blankets are so different from that. The 100% Organic Muslin Swaddle Blankets I received for review were very different but, so high quality I wished they were just a little bit bigger for my bed. 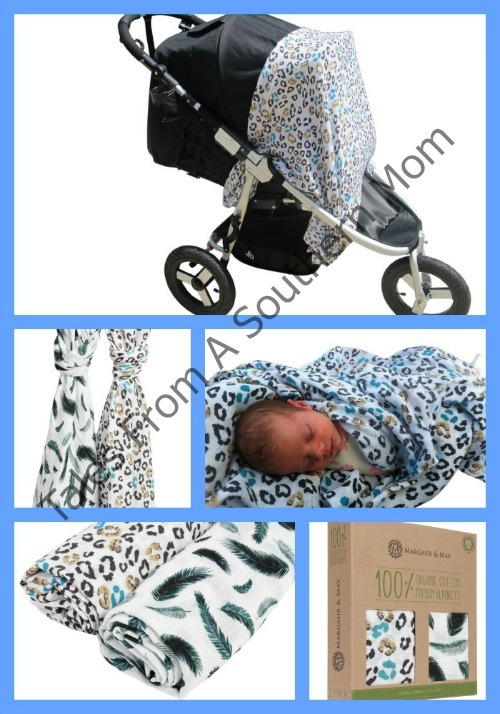 The blankets are so large that they can be used for so many things from swaddling, a stroller cover, a car seat cover, a picnic blanket, they are great for blocking the sun when baby is sleeping. felt buttery soft, but after i washed them they were even softer, I am sure that will continue every time I wash them. These are a bit thicker than some other muslin blankets, which allows them to hold up better and block sun more efficiently. They are 47″ x 47″ which means they are large enough for a swaddler even on a bigger baby, I loved that they were large enough so that they corner at the end went all the way around to be tucked in nicely in the front of the baby. Even though they are thicker they are still very breathable. The 100% Organic Muslin Swaddle Blankets come with a lifetime “better than money back” guarantee. They are that sure that you will love them. Don’t leave them in the box or put them away after that newborn period, Destini loves to use them for a clean place to set her doll babies on and the size is good for her to lay down on and cuddle up. With the stylish prints and great quality I am sure the 100% Organic Muslin Swaddle Blankets will soon be one of your favorites as well! I love muslin for me look forward to trying it for baby!